It is with sadness for our loss, yet gratefulness for a wonderful life, that we announce the passing of our Mother and Grandmother, Ella, shortly after her 99th birthday. She passed away peacefully at Village at Mill Creek with loved ones by her side. Ella is survived by her son Tony (Lee) Scrivens; adopted daughter Piri Blys; 12 grandchildren; 17 great-grandchildren; and 8 great-great-grandchildren. She was predeceased by her husband Joe, daughter Ann, son-in-law Jack and adopted son Kauri. Born in Dundee, Scotland, she came to Canada as a child. Ella was a faithful, long-time member of The Church of Jesus Christ of Latter-Day Saints and she loved her role with the Annual Creche presentation. Volunteering was a big part of her life in Kelowna which included the Kelowna Arts Council, Laurel Packing House, Kelowna General Hospital, Kelowna School of Ballet and Theatre Kelowna Society. She was on the Board of Directors of the Arts Council of the Central Okanagan (previously known as KADAC). 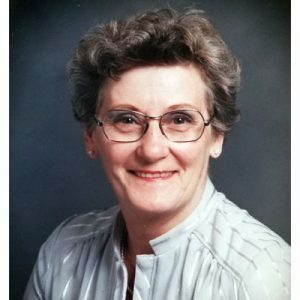 She was a lifetime member at Theatre Kelowna where she produced and directed plays, sewed wardrobes and made props. Her time at Kelowna School of Ballet also included looking after the principals of the annual presentation of The Nutcracker. A Service will be held at the Church of Jesus Christ of Latter-Day Saints, 696 Glenmore Road, Kelowna, on Saturday, October 20, 2018 at 1:00 pm. Graveside Service will be held on Tuesday, October 23, 2018 at 11:00 am at Kelowna Memorial Park Cemetery. The service for HAPI, Isabella Clow “Ella” (nee Muckersie) is scheduled for Saturday, October 20, 2018 at 1:00 pm. Below you will find the map for the service location and the contact information should you have any questions. Uncle Joe is so happy to have his Ella back with him. May you al;ways have them in your hearts and they will be in mine. May the Lord grant you peace at this time.